Daru is one of those fruits, which have got high economic importance in their respective region. It grows in the vast tract of the hill slopes of Jammu and Kashmir and Himachal Pradesh. 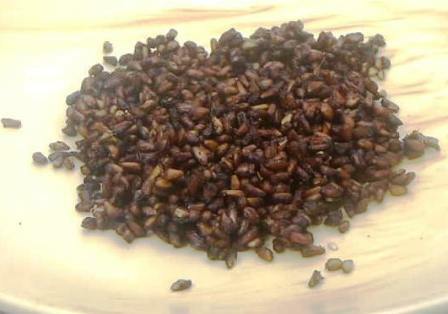 Its seeds are sun-dried to make anardana. Every year, anardana, worth thousands of rupees is collected from the hills and sold at various places throughout the country. Besides, anardana, huge quantities of the fruit rind, worth millions of rupees, is exported for use in various industries. One of the important centres of wild pomegranate in Himachal Pradesh is Darlaghat, which is located about 50 km from Shimla. 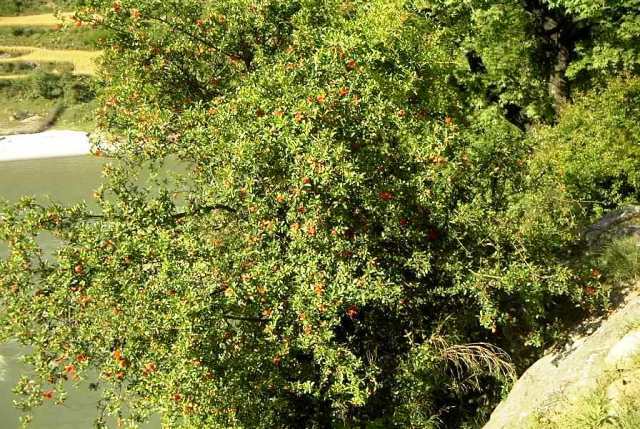 The word Darlaghat literally means place of wild pomegranate-trees. An erect deciduous spreading shrub or tree, 8 to 10 metres high; stern, woody and thorny; girth of main stem, 48 to 78 cm; wood, very hard and light yellow; leaves shed in December, new light red leaves appearing in the middle of March, new growth, very ornamental. Leaves, opposite, lanceolate, shining from above, 5.7 cm long, 1.7 cm broad, having entire margin; petiole, thin, 4 cm long; leaves, often clustered on arrested branchlets. Flowers, sessile, ebracteate, complete, actinomorphic, bisexual, solitary or in axillary clusters of 2 to 6; length, 3.7 cm; diameter, 3.6 cm; colour, claret rose 021; calyx, actinomorphic, persistent, thick, fleshy, 3.1 cm in diameter; corolla, polypetalous. with six petals, begonia 619 in colour, caducous, actinomorphic, inserted at the top of the calyx lute; length, 2 to 2.5 cm; androecium, with numerous stamens, inserted at different levels below the petals, polyandrous; filament, 4 mm long, light red; anther-lobes, dorsifixed and light yellow; style and stigma 1 to 1.2 cm long; ovary, inferior, containing numerous ovules, ovary enclosed entirely within the persistent calyx tube. Fruits, globular, crowned by a persistent calyx, possessing a hard outer rind diameter, 4.2 to 6.6 cm; weight, 80.5 g volume, 78.5 ml colour, yellowish green, with a red tinge. Seeds, angular, with a fleshy aril which constitutes the edible part; colour, varying from red to pinkish white, however, in most cases, it is rose opal 622. Dr. J. K. Sharma, a student at Dr. Y.S. 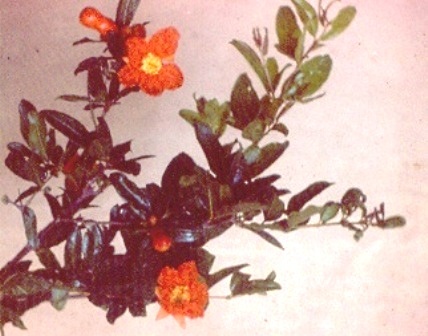 Parmar University of Horticulture and Forestry carried out a comparative study of the taxonomy of daru and the cultivated pomegranate in 1991 for his Ph.D. thesis. Besides morphological comparisons, he also compared them by following numeric and chemo taxonomical techniques. Dr. Sharma, concluded that daru varied distinctly from pomegranate and should therefore be given the status of a separate species of pomegranate. The flowering season of the wild pomegranate was observed to be from the middle of April to the end of May under Sanwara (H.P.) conditions. Two off-season blooms of much less intensity also appear during July and November. However, there is no fruit-setting from these blooms. The fruiting season under Sanwara conditions was observed to be from the first week of August, to the end of September. The yield varies with the size of the tree. The average yield recorded during the present studies under Sanwara conditions was 32.4 kg per tree. The edible portion, which is 64 per cent of the whole fruit, contains 69.5 per cent moisture and 64.8 per cent extractable juice. The total soluble solids content of the juice is 15.5 per cent. The acidity and the pectin content of the fruit juice is 5.53 and 0.06 per cent respectively. The edible portion contains 10.01 per cent total sugars, 8.87 per cent reducing sugars and 1.08 per cent non-reducing sugars. The proportion of vitamin C is 36.62 mg per 100 ml of juice. The tannin content of the edible part is insignificant; however, it was 9.33 per cent in the rind. The protein content of the edible part is 2.57 per cent. The total minerals content of the edible portion, as represented by its ash, is 1.491 per cent. The percentage content of some of the mineral elements viz., phosphorus, potassium, calcium, magnesium and iron is 0.104, 0.473, 0.031, 0.132 and 0.0046 respectively. The juice of fresh leaves and young fruit of this plant are given in dysentery. The powdered bark is given for expelling roundworms. Unripe fruits and flowers of daru are useful in inducing vomiting and the rind of the fruit is given in diarrhea and dysentery. They also strengthen the gums. Ripe fruits are tonic, laxative and enrich the blood. They are also useful in sore throat, sore eyes, brain diseases and chest troubles. 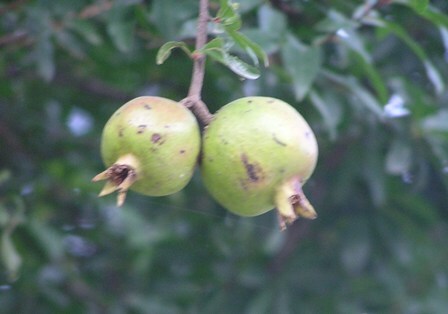 ‘The major use of wild pomegranate is for the making of anardana, which is used in making chutney and as a souring agent in various preparations. The price of anardana in Solan market, which is an important centre for this product, is up to Rs. 300 per kg. The dried rind yields a fast yellow dye, which is used for dying cloth and for making a hair dye. The fruit rind is reported to contain 30 per cent tannins which can be successfully used in combination with synthetic tannins for tanning leather. Root bark contains per cent of tannins which could be used for tanning and dying leather and also making jet-black ink. The juice of the fresh daru leaves and young fruits are useful in dysentery. The bark contains an alkaloid, punicine, which is highly toxic to tapeworms. The flower-buds are astringent, and are given in chronic diarrhea and dysentery. Pomegranate butterfly (Virachola isocrate Fabr.) is the most serious pest of this fruit and is responsible for heavy damage. 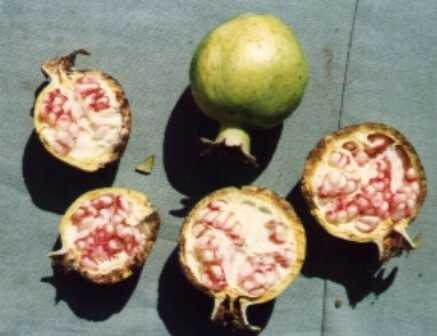 In fact, this pest is a limiting factor in the cultivation of wild pomegranate. The caterpillars of this insect are responsible for rotting and premature dropping of fruits in the rainy season. This tree can be successfully grown on a commercial scale in wastelands, with practically no cost of cultivation. Suitable control measures against the pest are required to be devised immediately to increase the yield of wild pomegranate tree which will ultimately increase the revenue of the State. So far, the seeds of wild pomegranate, which are fleshy, are just spread on the roofs and sun-dried to make anardana. Improved techniques of dehydration should be tried to obtain a better product. The juice of the fruit of wild pomegranate can make a very good squash. Techniques should be standardized for this purpose. The wood of the tree is very hard and durable. It is generally used in making agricultural implements.